Inspire Magazine: Thank you for speaking to Inspire Magazine, and many congratulations for winning the 2016 Algerian Paper of the Year Award in Computer Science & Engineering. Can you tell us what your award paper is about in simple terms? Omar Rafik Merad Boudia: In this paper, we propose a security protocol for data aggregation in wireless sensor networks. In this kind of networks, the energy conservation is the key issue in the design of systems. Data aggregation is widely used in most of applications due to its advantage of reducing the communication cost. In order to secure the aggregated data, our scheme involves the use of the two kinds of cryptography, namely symmetric and asymmetric encryption. Our hybrid solution ensures the data confidentiality and integrity using efficient algorithms, which leads to an efficiency in terms of computation and communication, and consequently prolong the battery lifetime. IM: Why is this an important scientific problem to address? Network model. © Elsevier B.V. All rights reserved. ORMB: It’s true that data aggregation preserves energy, however, it cannot be employed without taking into account the security issues. In fact, in sensor networks, the nodes are usually deployed in unattended and uncontrolled environments. Also, the intermediate nodes process the data that concern several nodes of the network, which attracts attentions, where it is more interesting for an attacker to compromise this type of nodes rather than a simple measure of a leaf node. After gaining control, the attacker will have in his possession all the cryptographic material stored in the sensor, and this allows it to generate malicious data, listen to network activities, delay system response or even inject erroneous packets. For a military application for example, this leads to catastrophic consequences. Therefore providing security is crucial. The most interesting question is: How to secure data aggregation without affecting the battery lifetime? ORMB: Our proposal adopts stateful encryption, proposed by Bellare et al. (2006) This kind of encryption is very efficient in terms of computation and communication especially, when elliptic curve groups are considered. Through simulation and experimental results, we showed the huge decrease of energy consumption in comparison with existing works. We also proposed an efficient algorithm that allows the base station to extract individual data, verify the integrity of all messages, authenticate the senders and eventually identify the malicious node. Finally, we proposed a secure implementation on MicaZ and TelosB platforms against side channel attacks. ORMB: The major part of this work has been conducted at STIC Laboratory headed by Pr. Feham in Tlemcen University. The other support we had was from Burgundy University (France) at Drive Laboratory represented by Pr Senouci. IM: How did you get into this particular research and were does it fit in relation to other work conducted in your research lab or institution? ORMB: This work falls within the scope of my PhD project “Secure Data Aggregation in Wireless Sensor Networks”. I already worked on that project in my Master degree and that was a good introduction for me to this future direction. Also, since the beginning of my studies at university, applied cryptography has always been the focus of my research. In our lab, we address several topics on network security, and very good results were obtained so far. ORMB: With the advent of new technologies and the growing number of connected devices, security and privacy become of primary concerns. We would like to see our security protocols deployed in real applications and help to develop our industries. However, in Algeria, the university-industry partnerships are still at an early stage. Recently, big means have been provided by our ministry to making this partnerships work. 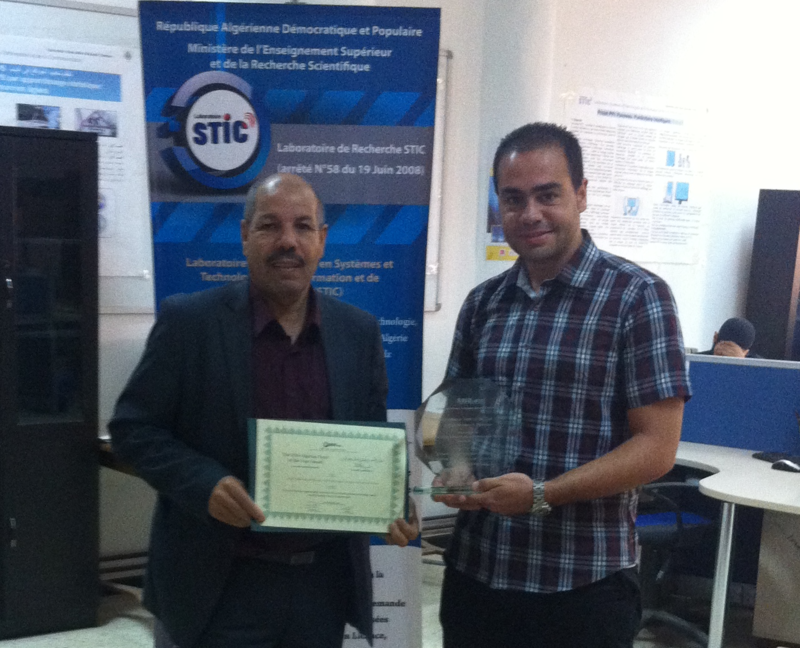 In fact, with my team at STIC Laboratory, we have several projects with socio-economic partners which are in progress.